Hatlingsetra is Steinkjer's only summer mountain farm and is located in idyllic surroundings overlooking the lake Hatlingsvatnet in Stod. Open for drop-in on Sundays in the season for mountain adventures and delicious traditional "seter" food like sour creaam porridge. Hatlingsetra is also perfect for celebrations dinners like weddings and birthdays. 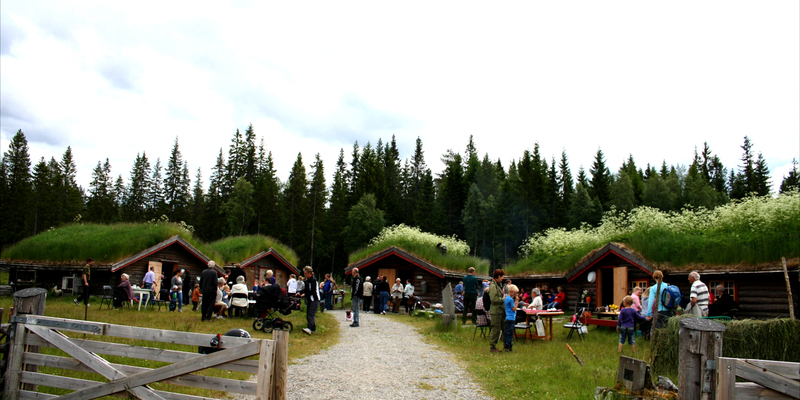 – Mountain farm adventures at Steinkjer’s only operational summer mountain farm (seter). Head to the mountain pastures and visit Hatlingsetra, located in idyllic surroundings overlooking the lake Hatlingsvatnet in Stod, Steinkjer. We are operational from July to mid August every year and are open to drop-in visitors on Sundays during the season. We serve delicious local food made from local and our own produced ingredients (eg. sour cream porridge and “black kettle” coffee). As a visiting summer mountain farm, we offer good atmosphere with pail milking of cows, separation of milk the old way and close contact with cats, cows, rabbits, horses, lambs and chickens. There is a children’s corner on the meadow with a sandpit, swing, mini farm house and Our own specially made wooden dairy cow. Fancy enjoying a delicious meal with beautiful scenery as a perfect backdrop? Hatlingsetra tailor your party to your specifications, offering delicious food prepared with own produced and local ingredients; single dishes or 3-course dinners and the worlds best coffee, «black kettle» coffee! 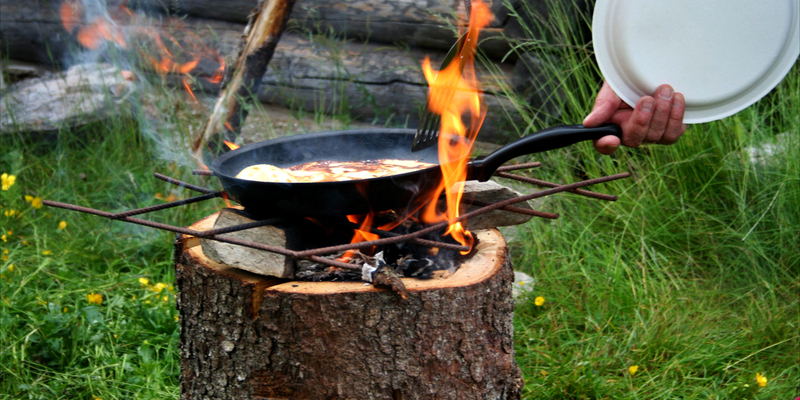 All served in an old-fashioned notched mountain farm building with crackling log fire. We accommodate up to 50 people indoors and during good weather, the coffee can be enjoyed outdoors on the mountain farm embankment. Hatlingsetra is perfect for celebration dinners like weddings and birthdays. Must be pre-booked. If you want entertainment for your dinner or party, Hatlingsetra Setra Knort & Separatorkompani happily entertain your guests. They are winners of the revue festival in Høylandet in 2009. 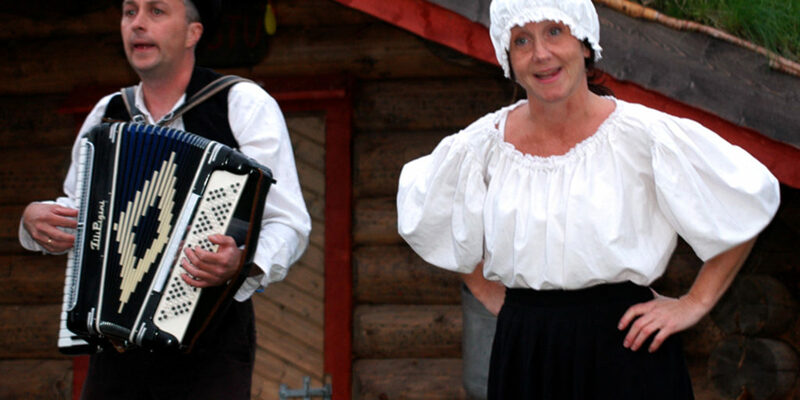 Accordian music entertainment can also be arranged, if that is your wish. Welcome to Hatlingsetra Summer Mountain Farm!